What do Hollywood stud muffin, Hugh Jackman and I have in common? •	Fine examples of rugged, antipodean handsomeness. •	Rocking pretty kick-arse beards at the moment. •	And we’ve both been diagnosed with the same type of skin cancer. Yes, his Wolverine-ness and I have both had “Basel Cell Carsinomas” removed. But never fear – neither Hugh, nor I will be shuffling off this mortal coil any time soon! BCCs are the most common form of cancer. In terms of skin cancers they are one of the “better ones” (if there is such a thing – sounds like an oxymoron to me) to get and while rarely fatal, do have a nasty habit of spreading and tend to ulcerate their surrounding skin making them quite unsightly in the long-run. So they are still considered “malignant” and best removed as soon as possible. They are most commonly a result of over exposure to ultra-violet light, making sun-loving Australians like Hugh and cricket playing New Zealanders like myself prime candidates. My surgeon tells me there might also be a fair dose of heredity in contracting them too. Both my Mum and Dad had BCCs removed, so it was only a matter of time before I was next. 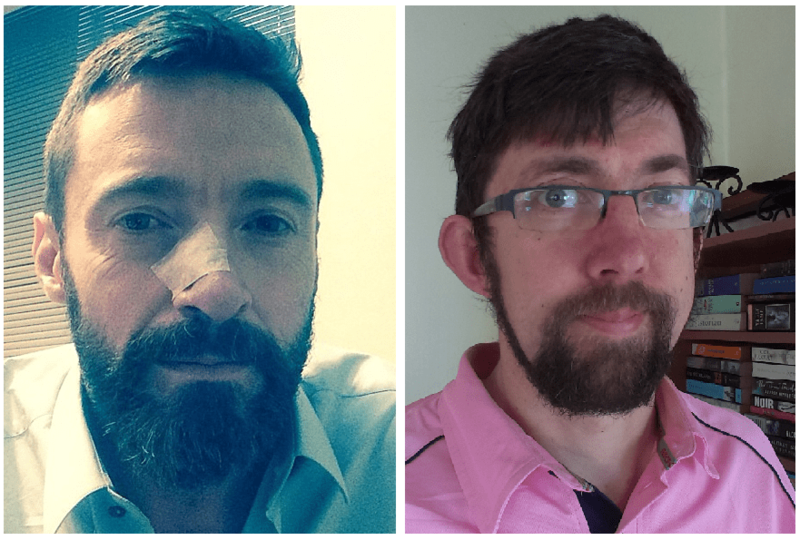 Earlier this year Hugh took to social media to encourage others to wear sunscreen and get any dodgy moles checked after he had a second procedure to remove a BCC from his nose. In a couple weeks’ time I’m going under the knife again, too, to get some more removed. This time from around my face and ear. It’s one of the reasons I’ve been growing a beard over winter – not to hide them, but because my moles are around my hairline, so I will be undergoing a very severe buzz-cut before surgery and decided to enjoy some facial hirsuteness while I could. My wife loves my beard, calling it “the least douchey beard I have ever seen” (That IS a compliment… I think…) – she appears to have a pathological hatred of the current “Hipster Beard” trend. Working in the office of a forestry company, I’ve gone more for the “Full Lumberjack” look. “And I’m OK” with that! My new cranial aerodynamic-ness will come in handy with the cricket season fast approaching and I won’t have to fuss about with my hair in the morning for about three months. It will, however, also show off the aftermath of surgery rather obviously. But I will wear my scars with pride. They certainly aren’t my first and won’t be my last. Like the frown and smile lines around my eyes and face, they will show I’ve lived (and will continue to live) a full life. I’m sure Hugh will do exactly the same! If YOU have any suspiscious moles or spots on you skin, PLEASE see your doctor, or somewhere like Molemap to get them checked out! It may be nothing at all, it may result in a small scar, or it could save your life! 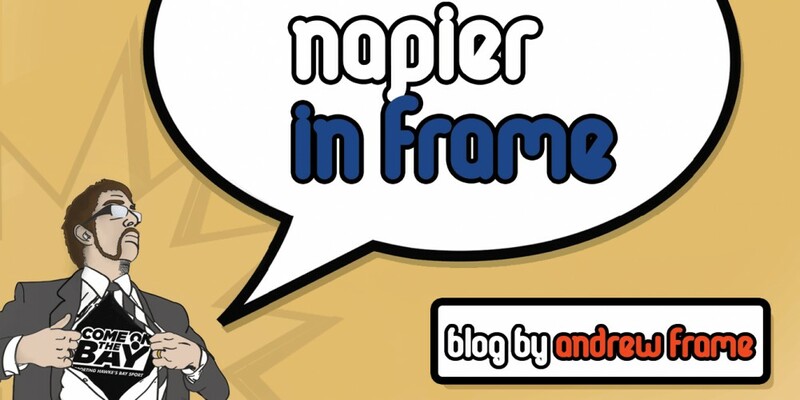 This entry was posted in Hawke's Bay, Media, Opinion, Social Media, Sport, Writing and tagged Hawke's Bay, Humour, Napier, Opinion, Twitter, Writing by Andrew Frame. Bookmark the permalink.